In the sports world, it has become cliché for people to say that every second counts. However, we expect that phrase to apply on the field, not to the teams trying to get there. Recently, a friend of mine wanted to register his team for a local kickball league. The registration was online only, starting at noon. He had a problem with his credit card that slowed him down, and by 12:02, all the spots in the league were taken and his team was shut out. Rather than seeing his misfortune as a sign of kickball’s growing popularity, or the quick typing skills of other kickball managers, the first thing that came to my mind was that the market for league entries must be distorted. The league uses public fields that also need to accommodate other sports and high schools, so time on the fields is limited. 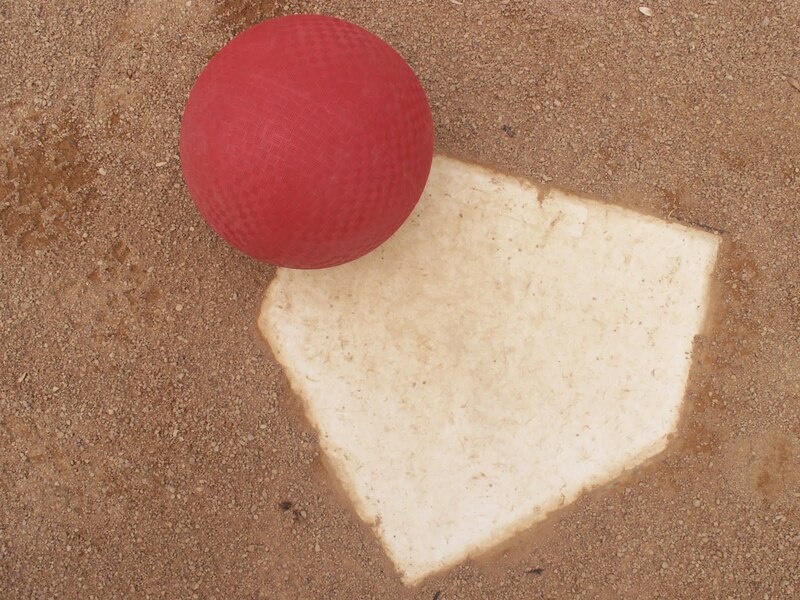 Since the kickball league will only have a fixed number of hours on the fields, and since the season needs to accommodate a set number of games, it’s fair to think about the supply of league space as fixed, or perfectly inelastic. Most importantly, even at very high market prices, there is no way to add additional teams to the league. 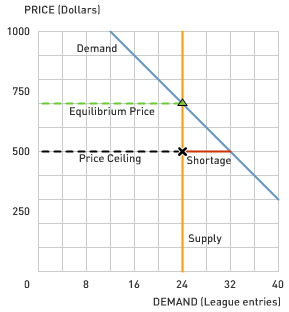 If limited space were the only constraint on the market, then we could find the equilibrium for the market at the intersection of supply and demand, and thus know the equilibrium price where there are exactly as many teams willing to pay as there are spaces in the league. However, since the league filled up so fast, and teams (like my friend’s) that are willing to pay more than the $500 entry fee are unable to join, it appears that there is an artificial price ceiling in this market. Since the league is publicly run, it is likely that someone decided on a “fair” price to charge, so that entries in the league would be open to people of varying incomes. Unfortunately, price ceilings create shortages, that is, they force some people who desperately want the good to go without it. When goods do not sell for the unrestricted equilibrium price, people who value the entries the most do not necessarily receive them. Thus, the shortage caused by a binding price ceiling will end up lowering society’s total welfare. Can economic theory suggest a solution that would still offer entries at the “fair” price, but also make sure the entries go to the teams that value them the most? Suppose that the league entries were still given out the same way, but once initially purchased by a team manager, an entry could be resold to a team that did not sign up fast enough, if both parties agree. Teams that got entries and value them at least as much as the equilibrium price will hold on to their entries, but teams that were too slow to purchase them initially will be able to buy them from teams who value them less than the equilibrium price. In terms of the final price and quantity of entries, making the league entries tradable will achieve the same result as removing the price ceiling altogether: the market price for the tradable entries will rise to the unrestricted equilibrium price, and the teams that value them the most will end up in the league. However, setting a lower price initially allows some teams the opportunity to buy that otherwise wouldn’t be able to get them. Society’s total welfare is maximized by either making the entries tradable or removing the price ceiling, the only difference is who earns the surplus. As you can see, there are different ways to maximize society’s welfare. Some can be more complicated than others, but they can accommodate different concerns about fairness. 1) Currently, the market mechanism used to allocate kickball league entries is first-come-first-served. What behaviors does this sort of mechanism encourage? 2) If league entries are tradable and originally given on a first-come-first-served basis, who would attempt to get the initial entries? Is there a chance people who do not want to have a kickball team might apply for a slot? Under a tradable permit system, does the way the entries are initially allocated affect who receives the most welfare? 3) The Coase Theorem is a public economics result that applies to markets where governments want to reduce pollution. It says that the most efficient way to reduce pollution to any desired level is to give firms in an industry permits to pollute the desired amount, and then allow the firms to trade the permits. Consider the similarities between a fixed number of kickball league entries and a fixed amount of pollution by an industry. What results would you expect to see in the market for pollution permits? What effect would creating that market have on society’s welfare? Land or Dishes? Dishes, please! Low Carbs, High Fat…High Prices?